DeBose is no overnight success story, though. Her career has been decades in the making, and is built on her amazing work ethic, which she credits to her strong-willed single mother. "She was a public educator who valued learning," says DeBose. "I always needed to be better than I was the day before. Not trying wasn't an option." As a young student, DeBose trained in multiple styles at CC & Co. Dance Complex in Raleigh, NC, and competed regularly at New York City Dance Alliance and West Coast Dance Explosion. "I was the comp kid who never actually won anything," she says. "I was a Regional Outstanding Dancer, but I think I only made the Top 10 at NYCDA once." Nevertheless, she loved learning from the likes of Mandy Moore, Sonya Tayeh, Jason Parsons, and Lauren Adams at conventions and master classes. As a teen, DeBose switched her focus to musical theater, mainly because of the high cost of competition dance. The first high school show she auditioned for was Fame—and she ended up snagging the lead role of Carmen, because there wasn't anyone else who could dance. "I was terrible! My singing sounded like a foghorn," DeBose says. "But I realized I loved the challenge of trying to sing and dance at the same time." She started taking acting classes at school as well as private vocal lessons, and participated in county-wide productions. 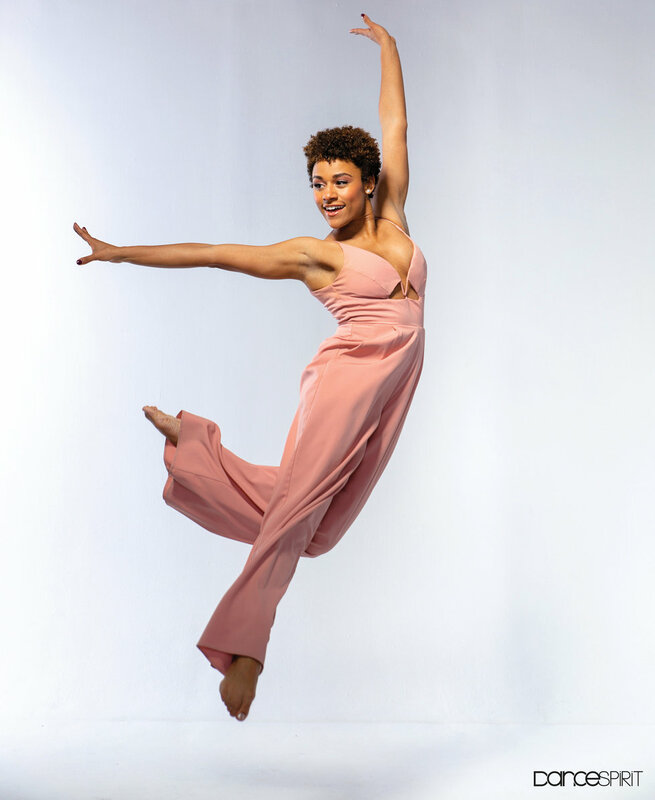 After high school, DeBose made it to the Top 20 on Season 6 of "So You Think You Can Dance" before enrolling at Western Carolina University's musical theater program. But she left college after three months. "At that point, I'd already had some professional experience under my belt, and I wasn't quite fitting in at school," DeBose says. Eager to enter the workforce, at 19 she headed to NYC—and she never left. DeBose says her mentor, legendary Broadway star Charlotte d'Amboise, gave her the confidence she needed to make such a big leap. DeBose first met d'Amboise in high school, and began training with d'Amboise after attending her musical theater intensive, Triple Arts. The two became closer when DeBose was cast as Cassie in WCU's production of A Chorus Line, and d'Amboise—who earned a Tony nom for her take on the part in the Broadway revival of the show—coached her. "Charlotte helped me believe in my abilities as a dancer," DeBose says. "She told me I didn't need to go to college if I didn't want to." "Ariana was somebody who was just going to make it happen—she's driven in all the right ways and was ready for the next step," d'Amboise says. "She's always been a dynamic, fearless dancer. You just can't keep your eyes off her." Once in NYC, DeBose started living that classic dance-hustle life, sleeping on d'Amboise's couch. "I only had a little money and had to ration everything," DeBose remembers. Then, suddenly, she booked three jobs at once: Diana in a non-Equity production of A Chorus Line, an ensemble role in the first national tour of Wicked, and Nautica in a new show, Bring It On: The Musical. DeBose's intuition led her to choose Bring It On, and she made her Broadway debut with the production at 22. Next came roles in Motown: The Musical, the 2013 revival of Pippin, and a little show called Hamilton. "I'd describe Hamilton as a tidal wave of awesome," says DeBose. "It was just a really cool experience. To be terribly honest, had I not done Hamilton, I don't think the last few years would have happened. Or they definitely wouldn't have happened so fast." As much as DeBose loved performing in Hamilton, though, years of dancing in the intense show started to take a toll on her, both physically and mentally. "I had reached a place where I felt like my body was betraying me," she says. "It wasn't moving the way it used to, and that was a really hard thing for me to accept." After leaving the show, she made a conscious decision to seek out roles that would also make use of her singing and acting chops—and she resolved to no longer accept ensemble parts. It was a controversial move. "A lot of people told me that I was wrong when I said I didn't want to do ensemble roles anymore," DeBose says. "The community believed I was saying that ensemble work was bad. That was never it. It's just hard, and I needed a break." But she also had a deep-rooted trust in herself and her abilities. "With the way that I train and the way that I work, I knew that I had the skills to be successful," DeBose says. "I have an undying belief in myself." She headed back to acting and singing classes, putting in the work that would allow her to take her next step. That work paid off: She scored a leading role in the new musical A Bronx Tale. "I did very minimal dancing in A Bronx Tale," DeBose says. "I got the opportunity to prove my ability to sing and tell an interesting story without dance." After spending a couple years resetting her body in A Bronx Tale, DeBose earned the role of Disco Donna in Summer: The Donna Summer Musical. While music icon Donna Summer wasn't known for her movement, DeBose convinced the show's creative team, including choreographer Sergio Trujillo, to let this Donna be super-dancy. "They gave me the space to create something in the style of Debbie Allen, Chita Rivera, Rita Moreno, Charlotte d'Amboise, and Ann Reinking—all the women I grew up loving, who played dynamic powerhouse roles," she says. "With Ariana's talent, I was able to go way beyond my expectations for that role," Trujillo says. "She's really one of a kind and has the 'it' quality you need to be a star. I've called her my little Chita Rivera since the moment I met her." Being nominated for a Best Featured Actress Tony Award for the role was just the cherry on top—and something she truly fought for. The day the Tony voters came to see the show, DeBose was injured and ended up performing with a cane. "I knew that I wasn't a shoo-in at all. I wasn't a favorite by any stretch of the mind," she says. "So it was a very special nomination." The nom also felt like a validation of her career choices. "When the Tony hoopla died down, some of my colleagues who are ensemble dancers sent me messages," DeBose says. "They were like, 'Thank you for what you did this season. You showed people that dancers in the ensemble shouldn't be counted out. We can talk and we can sing.' "
Next, DeBose is set to tackle film and television. Playing Anita in the West Side Story remake will surely make her a household name, but she's mostly focused on proving herself, and making sure her skills can back up the hype. "I'm nervous and excited," DeBose says. "This is kind of a go-big-or-go-home moment, like, can I really act? There's a little bit more pressure than before." But if there's anything we know about DeBose, it's that she'll keep rising to the occasion. 1. "I'm multiracial." DeBose is Puerto Rican and white. 2. "I love Oreos and peanut butter. It's like a Parent Trap thing for me." 3. She's a huge fan of "The Golden Girls" and the British TV show "Absolutely Fabulous." "So basically, I'm a 70-year-old cat lady." 4. Speaking of which: She has two cats, Izzy and Freddy. "Like I said, 70-year-old cat lady." 5. "I love tea. Spilling it and drinking it." 6. She enjoys photography. "Maybe one day I'll pull a Jessica Lange and have an exhibition of my artsy black-and-white photos." 7. "My favorite lip gloss is by Yves Saint Laurent. It's gold and sparkly." 8. She's a homebody. "I'm actually a very simple person, and I like quiet." 9. One of her favorite foods is Baskin Robbins' rainbow sorbet ice cream. 10. "When I was a baby, I won Ivory soap's Ivory Baby contest. It was like being a Gerber baby." The causes she's most engaged in are LGBTQ issues (although DeBose is out, she doesn't claim any particular label) and women's issues. "Being a strong woman with an opinion these days is hard, so I want to empower young women and girls in whatever way I can," she says. "I want them to see that being yourself, standing up for yourself, being intelligent, and being fearless are all good things, and no one is ever allowed to take them from you." Yoga is a must. "I take Bikram a lot." She always keeps fresh flowers around. "It reminds me of the beauty in the world." She prioritizes "me time." "I make sure to have at least 15 minutes every day that's just mine. No social media, no phone calls, no work. I might read or just sit and have my tea listening to Yo-Yo Ma." She loves coloring books. "Give me a coloring book and I'm a happy person." She tries to have lunch with a friend at least once a week. "That really keeps me going because it reminds me that the world is still going on around me." A version of this story appeared in the May/June 2019 issue of Dance Spirit with the title "A Star Is Born."